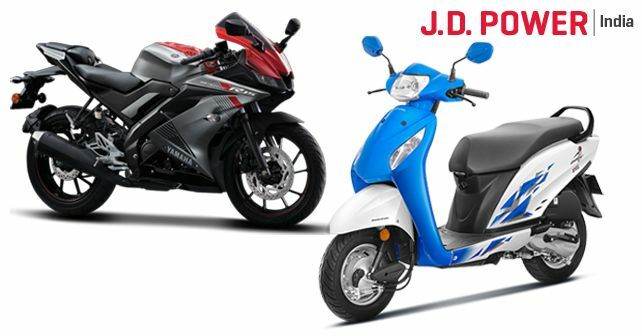 Two models from Honda and Yamaha each have bagged awards in the J.D. Power 2019 India Two-Wheeler Initial Quality Study (2WIQS) while Hero and Suzuki have bagged one award each. The J.D. Power 2019 India 2WIQS measured problems experienced by new two-wheeler owners during the first two to six months of ownership and examined more than 147 problem symptoms across seven different categories. In a descending frequency of reported problems, the categories were as follows: Engine; Brakes; Fit & Finish; Lights/Electricals; Ride & Handling; Transmission; Gauges & Controls. This year's findings have revealed that owners who rode more than 3,500 kilometres on their new two-wheelers in the first two-six months of ownership experience 40 per cent (30 PP100) more quality-related problems compared to those who rode less than 3,500km. The reported problem incidents have been summarised as the number of problems per 100 vehicles (PP100). Therefore, a lower PP100 score indicates a lower frequency of reported problems, implying higher initial quality rating. This difference is less (13 PP100) when it comes to design-related problems. Honda and Yamaha shared the top spot as both these brands saw two models each win an award. The Honda Activa i (86 PP100) secured the top spot in the Executive Scooter segment, followed by the Honda CB Shine (115 PP100) claiming highest honours in the Executive Motorcycle segment. The Upper Executive Motorcycle segment and the Premium Motorcycle segment were both led by Yamaha, with the Yamaha FZ/FZS (108 PP100) winning an award in the former category while the Yamaha YZF R15 V3.0 (86 PP100) took the top spot in the latter. The other manufacturers who managed to bag an award were Suzuki and Hero. The Suzuki Access 125 (94 PP100) took the top spot in the Upper Executive Scooter Segment while the Hero HF Deluxe/ Eco/ i3S (104 PP100) ranked the highest in the Economy Motorcycle segment. This year's 2WIQS rankings have been calculated based on responses from 8,905 owners who purchased a new two-wheeler vehicle between March 2018 and October 2018. The study includes 85 two-wheeler models from nine manufacturers. 'Deteriorating product quality can detract from customer satisfaction and confidence in the two-wheeler model across the entire ownership period,” said Rajat Agarwal, Two-Wheeler Industry Expert at J.D. Power. 'As the industry will soon be going through a paradigm shift in technology in order to meet the BS-VI emission norms as set by the Government, OEMs can also focus on addressing concerns around sustained product quality to gain from improved word-of-mouth recommendations,” he added. This year's study has revealed that there is a gap between design quality improvement as compared to manufacturing quality improvement. While problem incidents related to manufacturing quality have witnessed a decline between 2015 and 2019, problem incidents related to design have seen a lower decline (29 PP100 vs 12 PP100, respectively). Further, younger two-wheeler owners (25 or younger) report more initial quality problems than the mature lot (31 or above). The study has also found that the usage of the internet as a pre-shopping research tool has gone up from 16 per cent in 2018 to 20 per cent in 2019.